I'm excited to be writing my first blog post for F4ACLT. After telling Judy that I'm always going to different restaurants and trying new foods....a girl has got to eat......she asked if I'd be a resident guest blogger. Uh yeah, of course! I think it would be perfect for me to blog since I do like to be out and about in Charlotte and I know what to look for in matters of accessibility. If it's not accessible, we can't eat. Now that's a crime! To me, Sundays call for mimosas. There's something fancy about Champagne and OJ in a nice glass. I asked Judy if she knew any places where they had good mimosas. Of course she sends me a list....it will come in handy. Mimosa Grill was on the list, so I looked it up and it sounded yummy. They have brunch on Sunday. They have a buffet full of breakfast and even fish, cheeses, and meat. Yes, food to suite your craving. I'm more of a breakfast eater, so of course I got the typical American breakfast. I did venture out of my zone and tried a bit of grits. They weren't so bad....I did try it. And to go along with my breakfast, a delicious mimosa. I was slightly disappointed that they weren't bottomless and that the glass wasn't full. Hey what can I say? Mimosas should be a requirement. I'm not a dessert fan. No sweets for this blogger. Luckily I do have friends that have a sweet tooth, so don't worry, I will talk about sweets in my blogs. My friend got a plate of dessert that did look good. I did try a chocolate covered strawberry...delicious. Food is always important, but so is accessibility. 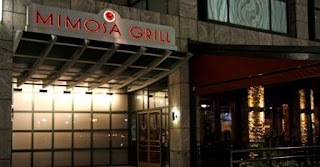 The restaurant is located in Uptown Charlotte near the Wells Fargo Bank. Be prepared to pay for parking. Getting to the restaurant is accessible. Getting in is slightly another story. The doors aren't automatic and there's no button for them to open automatically. The doors are heavy, so someone with no arm strength like me, needs to have someone open them. The restaurant is spacious and anyone in a wheelchair can get around. The floors aren't so wheel friendly. They are bumpy. These floors aren't throughout the entire restaurant, just at the entrance and around the bar. Once you enter the dinning area, it's carpeted. They do have an outside patio which would be great for the warmer weather. Overall, I would say it was a nice Sunday brunch experience. It's not a place where I would go to all the time, but if the mood strikes for a good brunch in Uptown, then I know where to go. I'm still on the hunt for bottomless mimosas!!! Stay tuned.